What do you do when you have leftover building materials from a project? I am a hoarder so I am afraid to let any of them go which is why I had 8 pieces of iron baluster left over from our rustic railings in my garage for months. They had been staring at me for a while and I was determined to find a way to use them. So when I decided it was finally time to make a new coffee table, I found a way to integrate the iron into it and it turned out awesome! 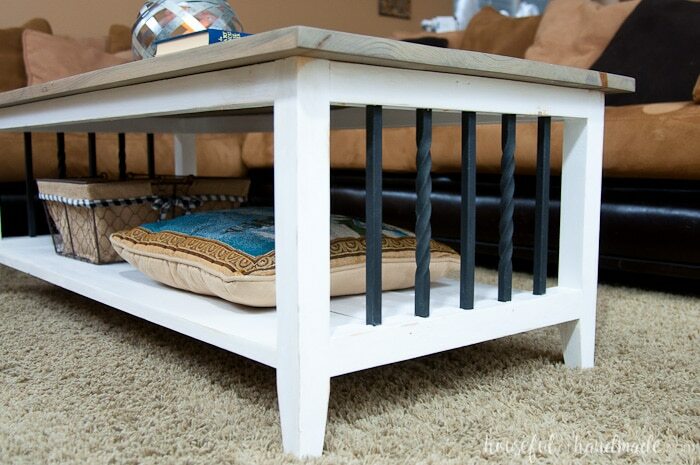 That is how these free farmhouse coffee table build plans were born. I have been wanting a new coffee table for way too long now. But I kept putting it off because I am sure someday we will be getting new carpet and the less furniture we have in the room to move out for the carpet install the better. However, I am still waiting (5 months later) and it just seems that there is always something else that needs that $2000 more than new living room and stairway carpet. I’m sure it will happen someday, but I am no longer going to put off making the living room a room we actually can live in just because of the carpet. 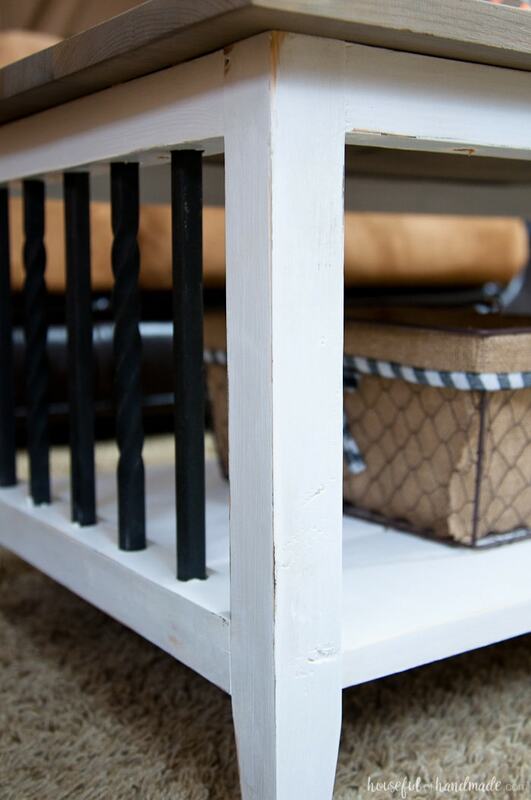 So this week I took some time to make our new farmhouse coffee table and I couldn’t be happier! 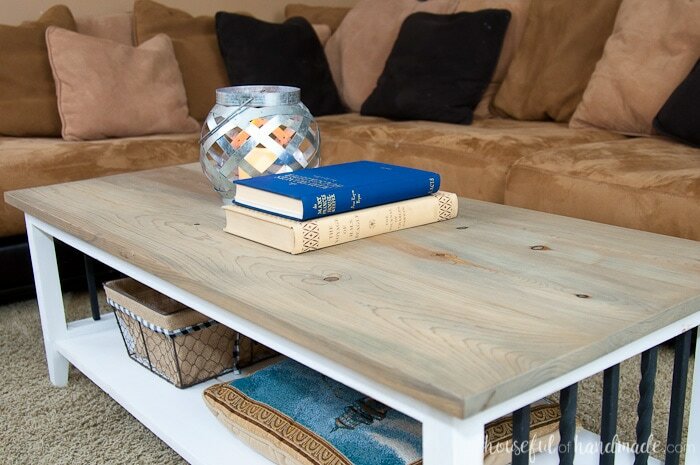 Thanks to the Kreg Jig, this farmhouse coffee table was a seriously easy table to build, but it isn’t lacking in the interesting details. 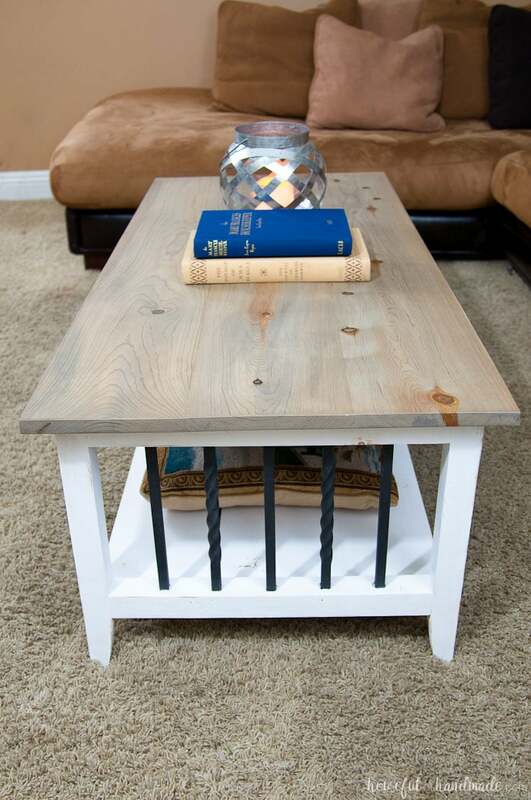 Using inexpensive iron balusters for the sides give the table a little rustic farmhouse touch. 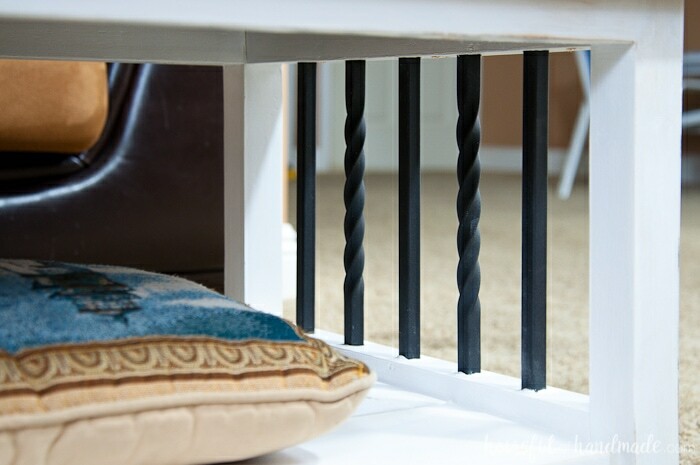 Because I did want a little extra oomph, I did buy a couple double twist iron balusters to use along with to my scraps, and it was totally worth it. 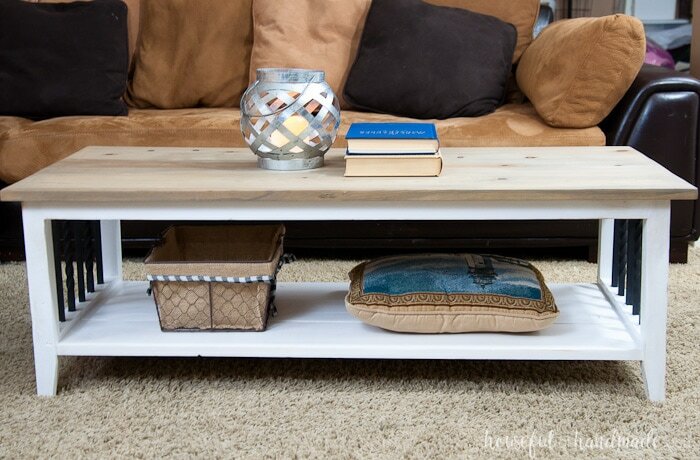 One of my favorite things about this coffee table is the extra shelf for storage. I hate having piles of stuff on top of my tables but I knew I needed a place to put things like remotes. Adding a cute little basket on the shelf keeps my table top clean and beautiful, but my husband still has his remotes at his finger tips (and anything else that they can’t live without). And lastly, I must mention the finish on the top of the coffee table. 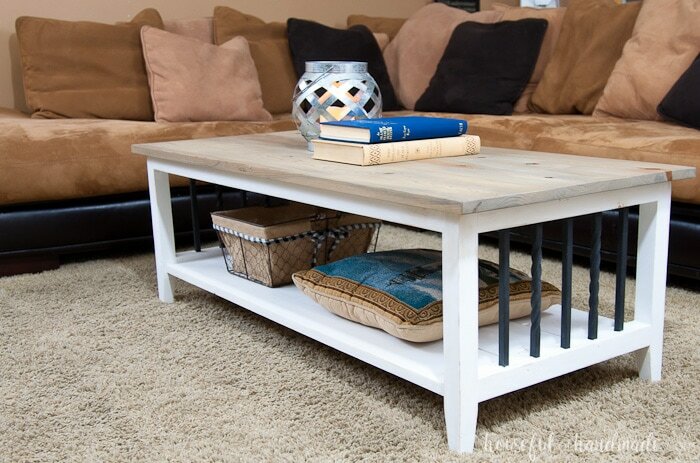 I knew I wanted a combination of slightly worn around the edges white paint with the soft gray of aged wood on the top. The only problem, I was working with all brand new wood. For the base of the table, I painted it with a soft white paint, then beat it up a bit, including adding a little stain to some of the edges. For the table top, I decided to try out the natural wood stain that is made by soaking steel wool in vinegar overnight. Combine that with some black tea and the perfect color was born. I get giddy every time I look at the top of it. It’s the perfect soft worn wood! I was so excited about way the table top turned out that I actually fretted over how to seal the wood to protect it from my family. I decided to seal it with 2 coats of a chalky sealing wax and it still has the aged, satin look instead of a gloss that you normally get with a polyurethane type finish. This is the first time using this type of finish on a table, I am hoping it can hold up to the wear and tear of my kids and husband (I caught him with his feet up on the coffee table today!). 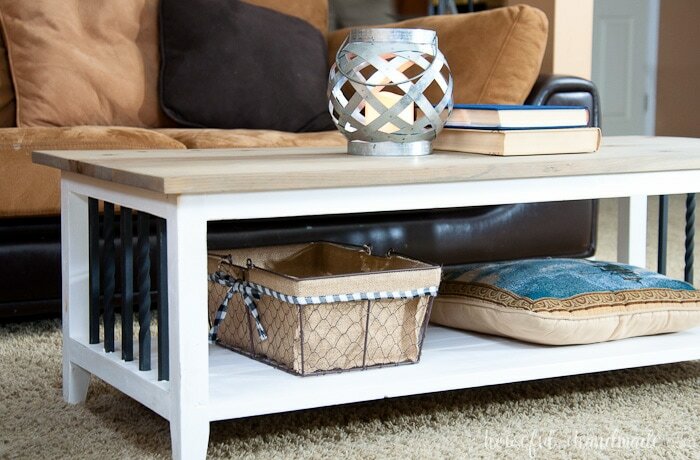 Mixing all these elements together gave me the perfect farmhouse coffee table and now I am ready to put my feet up (just not on the new coffee table) and enjoy living for a minute in our crazy half-done project house. At least until I finish this cup of coffee! 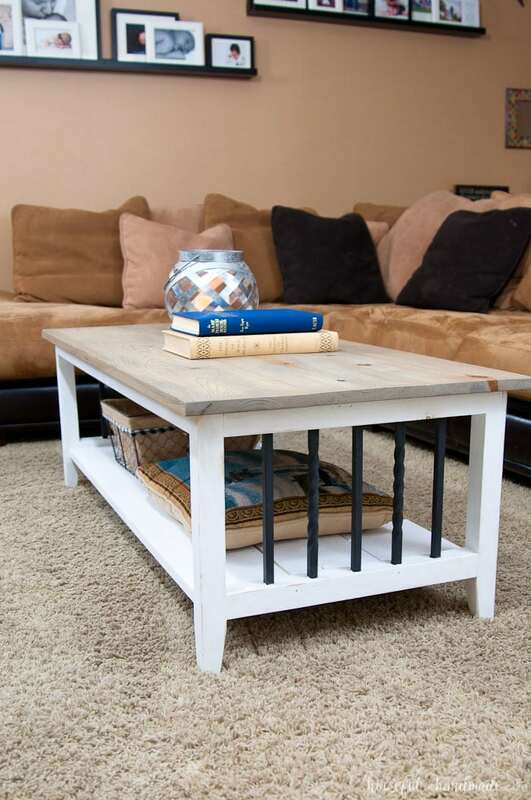 If you are ready to build your own farmhouse coffee table, you can find the free build plans over at Kreg Tool’s new DIY project plan site BuildSomething. 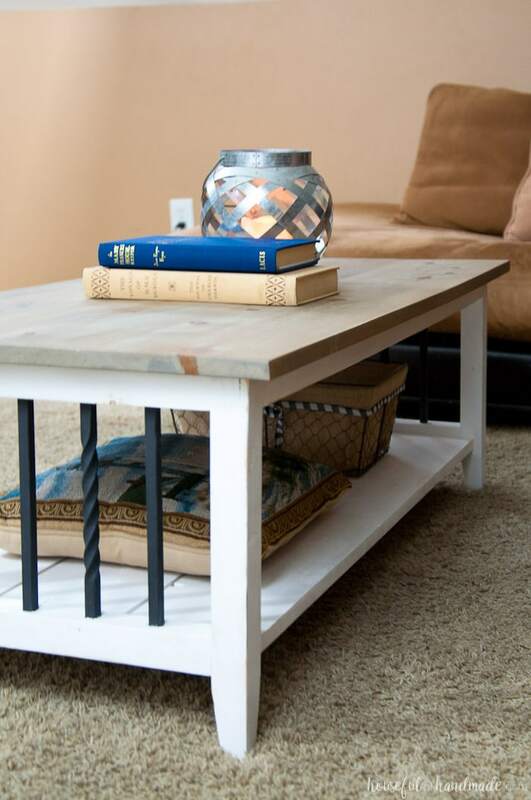 Click here for the free build plans for this coffee table. This post was sponsored by Kreg Tools and their DIY project plan site BuildSomething. All opinions are 100% my own. Click here to read my full disclosure policy. Now it’s off to another project! This is so pretty! I absolutely love the iron bars. Such a nice touch! This turned out beautiful, love it! That looks great! We have the same leftover spindles from our railing makeover. Love this idea. This is absolutely stunning! I love how cohesively the mixed textures and colors come together! Thanks for sharing with us at Merry Monday this week! Gorgeous! You did a great job! This is just my style. I want to make one this month! Thanks for sharing your talent! Thanks Ana! I am really loving it.